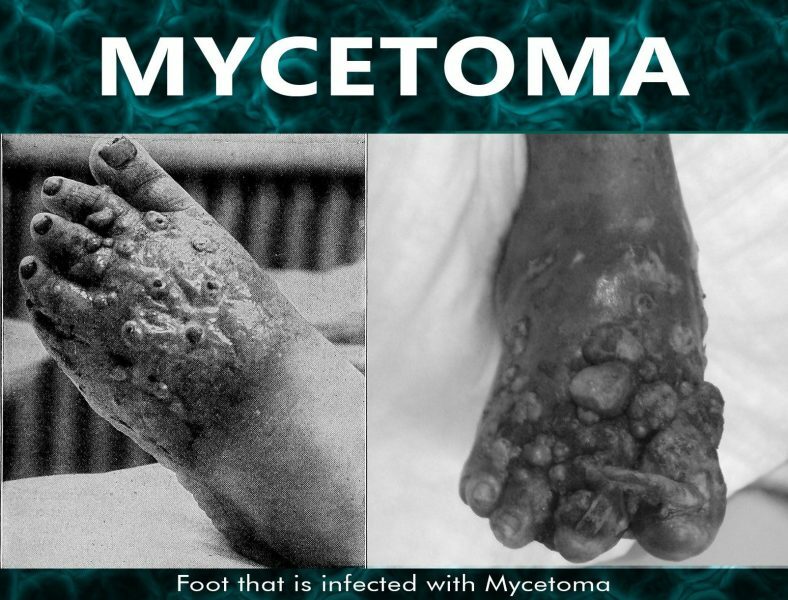 Mycetoma is a chronic disease caused by a progressive growth of bacteria and fungi. The fungi are commonly found in soil and water. The infection of the disease may result in a firm and makes the skin weak. It can affect your underlying bone. The bacteria can spread by entering the body through a skin breakage. It typically occurs in the foot. It affects people of all ages. Men are more prone to this disease. The reported cases of this condition have reached a higher number. This condition can be serious and life-threatening. An early detection and treatment can be of help to reduce the number of deaths. Also to improve the treatment outcome of the disease. The following are the cause of the infection. The following are the people at risk of developing this disease. There is no actual way of preventing the disease to occur. Because this condition is not a notifiable disease. It is difficult to prevent this kind of this disease. But people who travel, and living in endemic areas are advised not to walk with their barefoot. An early detection before symptoms occur can cause serious effects. It can reduce the risk of developing mycetoma. And early treatment can cure right away the condition. After the doctor, have diagnosed you with the disease. A treatment for the condition will take place. The treatments for the condition may be sometimes surgery. A surgery will take place if the disease is severe. But if it’s considered mild. The treatment may be antibacterial medication.